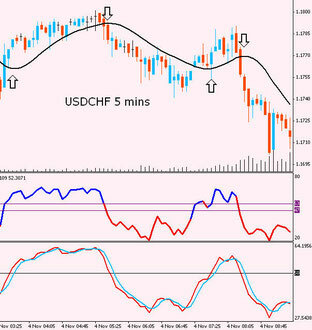 you choose short timeframes such as 5 minutes or 15 minutes. 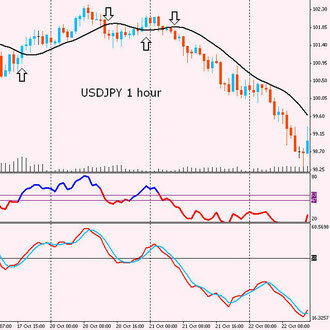 Freestyle is a trend following system, so lower time frames will cause more signals, but the moves will necessarily be smaller. I suggest that once you have your charts set up, you scroll back through time and see if you can spot the entry signals. 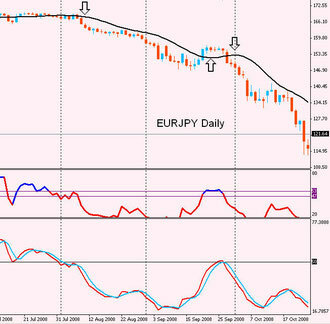 While the Freestyle System works for all currency pairs, I would also recommend limiting the number of pairs you are trading based on your ability to monitor the charts so you don’t miss any signals, and that you pay attention to spreads, particularly during volatile periods when many brokers increase spreads. The issue about spreads is less important when trading longer timeframes. Using Freestyle is very simple. As you saw from the chart above, the screen shows the chart of the currency pair with a single thick black line running through it. This is NOT a Moving Average, it is a line called the Laguerre Filter. 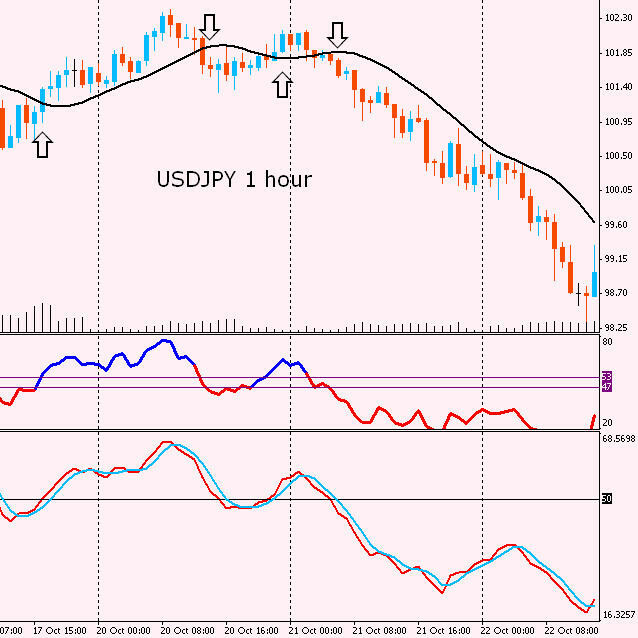 In addition, in separate windows below the chart you will see the Color RSI indicator with two horizontal lines at 53 and 47. And below that is the QQEA indicator. 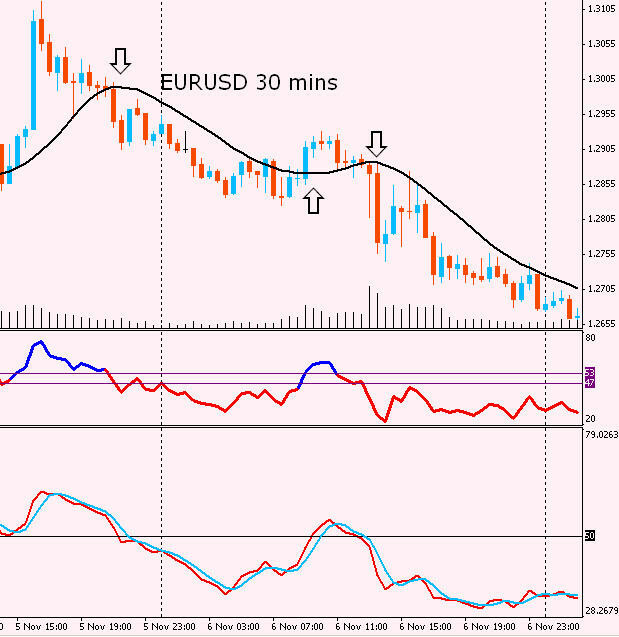 I have adapted this indicator so that it simply shows one solid red line. On top of that line is a simple 3-period Moving Average in blue. 1. The price candle closes above the black LaguerreFilter line. 2. 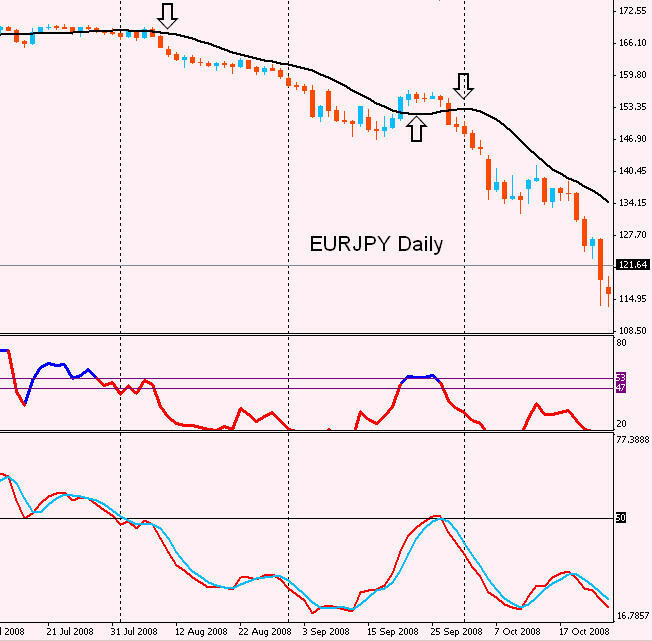 The Color RSI is blue and is above 53 (the upper of the two horizontal purple lines). 3. The QQEA line (the red one) has crossed up through the black horizontal line at 50. Do not enter a trade unless all three of these conditions have been met. The opposite preconditions are true for SELL trades. 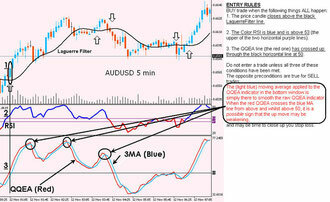 The (light blue) moving average applied to the QQEA indicator in the bottom window is simply there to smooth the raw QQEA indicator. 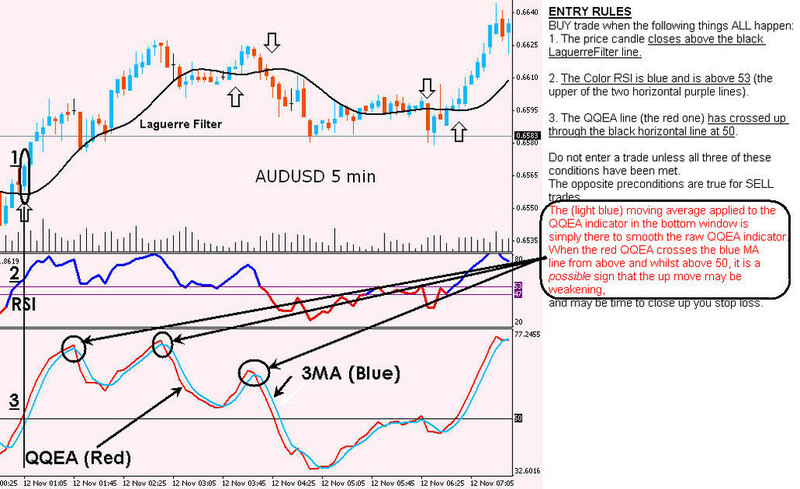 When the red QQEA crosses the blue MA line from above and whilst above 50, it is a possible sign that the up move may be weakening, and may be time to close up you stop loss. numbered 1 to 4, where the conditions of entry have been met. Trade 1 is a sell. Trade 2 is a buy. Trade 3 is a sell. Trade 4 is a sell. I’m not going to get into the deep and detailed subject of trading psychology – there is tons of information and advice on that on the Internet. However, first, let’s understand about setting trading objectives. Forex trading is not a “get rich quick” activity. If you think it is, then you are probably in the wrong business. Wealth can be achieved by producing consistent returns over time and minimizing losses. As I hope you have seen, the Freestyle system carefully selects entry points. How you decide to exit is a different matter, and will be affected by your attitude to risk and your goals. accumulated – a higher number of small trades, or a smaller number of bigger trades. 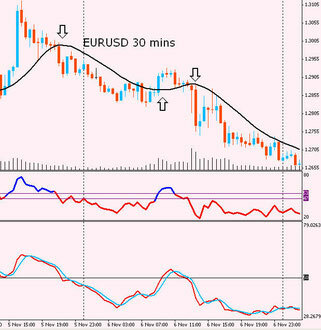 If you observe, say, 6 pairs at a time at the 5 min timeframe, then you will likely see 4-5 trades per day per pair. That could mean 24-30 trades per day. 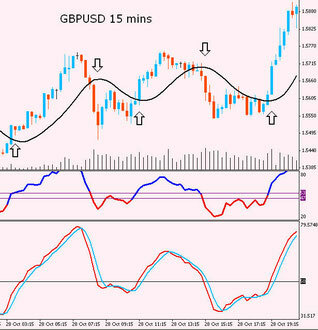 If you took just 5 pips from each trade that would mean 120-150 pips per day or 600-750 pips per week. I am sure you do not need me to explain to you how performance like this will quickly accumulate with proper money management. What about 10 pips per trade? Personally I would never open a trade without a Stop Loss, although I know traders who do. My reason is that if my connection fails or I have a power outage, I do not want to be left stranded, as it were. 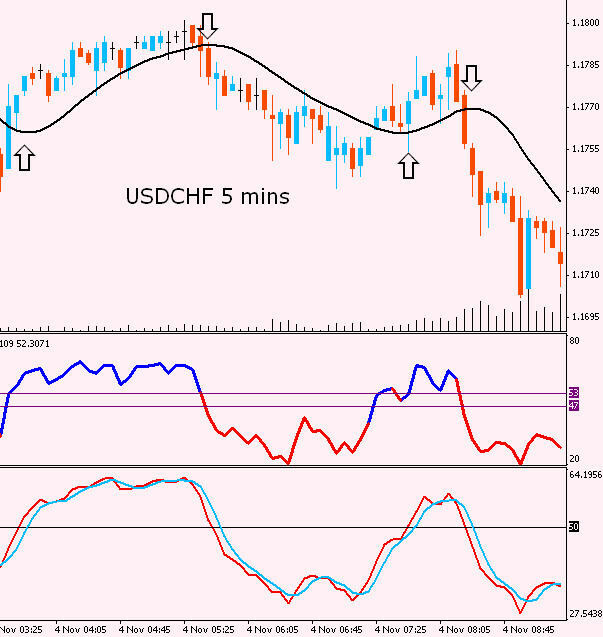 When trading at 5 minutes, I usually set a Stop Loss at around 40-60 pips away, depending on the pair I am trading, more if I am trading at 15 mins or 30 mins. 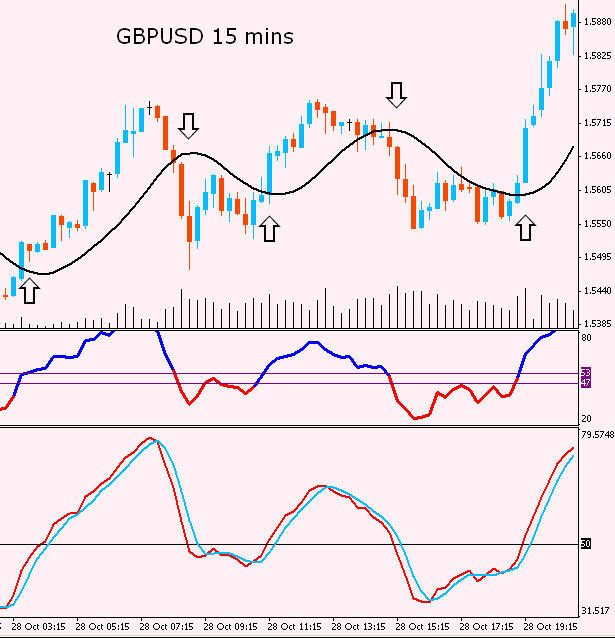 longer timeframes, as there is too much “noise” at shorter timeframes. c. Laguerre. Exit when the price closes on the other side of the black Laguerre line. Quite often the price candle will penetrate the Laguerre line, but in order to exit, you should wait for the candle to close. line crosses down through the light blue simple MA line on the close of a bar, then that is a potential signal that the up trend may be weakening. You do not necessarily want to exit the trade at that point, because often the market will continue upwards after a pause. However, it may be prudent at that point to tighten your Stop Loss. f. RSI. I know traders who, once in a trade, stay in that trade until the RSI line changes color, so if you are in a sell trade, you would stay in that trade until the RSI returned to a blue color. Naturally, these exit strategies can be combined. Strategy is very profitable. need patience. I use for 5 years. woww ... amazing.